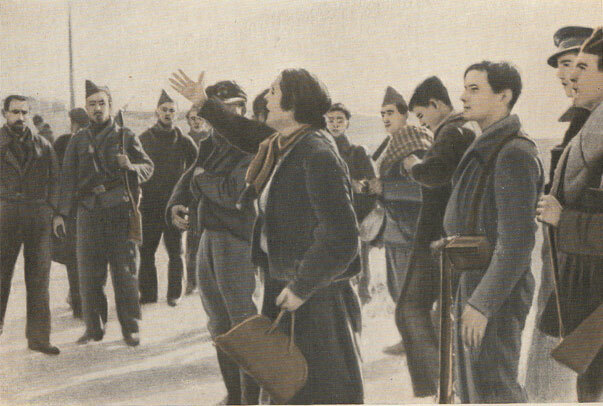 “From all peoples, from all races, you came to us like brothers, like sons of immortal Spain; and in the hardest days of the war, when the capital of the Spanish Republic was threatened, it was you, gallant comrades of the International Brigades, who helped save the city with your fighting enthusiasm, your heroism and your spirit of sacrifice. – And Jarama and Guadalajara, Brunete and Belchite, Levante and the Ebro, in immortal verses sing of the courage, the sacrifice, the daring, th discipline of the men of the International Brigades. “For the first time in the history of the peoples’ struggles, there was the spectacle, breath­taking in its grandeur, of the formation of International Brigades to help save a threatened country’s freedom and independence – the freedom and independence of our Spanish land. “Communists, Socialists, Anarchists, Republicans – men of different colors, differing ideology, antagonistic religions — yet all profoundly loving liberty and justice, they came and offered themselves to us unconditionally. “They gave us everything — their youth or their maturity; their science or their experience; their blood and their lives; their hopes and aspirations — and they asked us for nothing. But yes, it must be said, they did want a post in battle, they aspired to the honor of dying for us. “Banners of Spain! Salute these many heroes! Be lowered to honor so many martyrs! “Mothers! Women! When the years pass by and the wounds of war are stanched; when the memory of the sad and bloody days dissipates in a present of liberty, of peace and of well­being; when the rancors have died out and pride in a free country is felt equally by all Spaniards, speak to your children. Tell them of these men of the International Brigades. “Today many are departing. Thousands remain, shrouded in Spanish earth, profoundly remembered by all Spaniards. 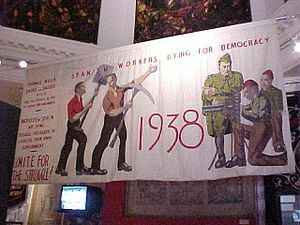 Comrades of the International Brigades: Political reasons, reasons of state, the welfare of that very cause for which you offered your blood with boundless generosity, are sending you back, some to your own countries and others to forced exile. You can go proudly. You are history. You are legend. You are the heroic example of democracy’s solidarity and universality in the face of the vile and accommodating spirit of those who interpret democratic principles with their eyes on hoards of wealth or corporate shares which they want to safeguard from all risk. “We shall not forget you; and, when the olive tree of peace is in flower, entwined with the victory laurels of the Republic of Spain — return!